The citizens of Kento haven’t exactly had an easy life. Several generations earlier, they were banished from their home country and sent out into the wilderness with scant supplies and only their wits about them. They found a possible site along a river and began by building a collection of houses, plus a hunting lodge and a place for people to go out and gather roots, berries, and mushrooms. The first few years were hard, but the people of Kento were strong. They slowly expanded their village, eventually replacing all of their wooden houses with ones built of stone. They cleared away the forest for fields, orchards, and pastures. When Kento was even bigger, they built a trading post on the river so they could trade for new seeds and animals from the occasional merchant. They had a school, a church, even a hospital. Their leaders, heady on their success, started welcoming in wandering bands of nomads, using the influx of new laborers to construct an iron mine and a stone quarry. Unfortunately, those same leaders forgot that the addition of dozens of new citizens meant that they needed to produce more food. During the winter after a particularly bad harvest, the citizens of Kento started to starve. The leaders tried to compensate, constructing new fishing docks and focusing the town on producing food, but it was too late. Dozens of people died. For close to a decade afterwards, portions of Kento sat unused. The new mine and quarry remained silent. If merchants wanted to trade, they couldn’t find anyone to help them at the docks. The people of Kento were focused on rebuilding, not only by constructing new food producing facilities, but also the number of their citizens. The bad winter was about thirty years ago, and the people of Kento have learned a harsh lesson. But they have also thrived since then. Their population is the highest its ever been. Their school is constantly packed. And they have more than enough food so that no one will ever starve again. This, my friends, is my experience playing the video game Banished by Shining Rock Software. 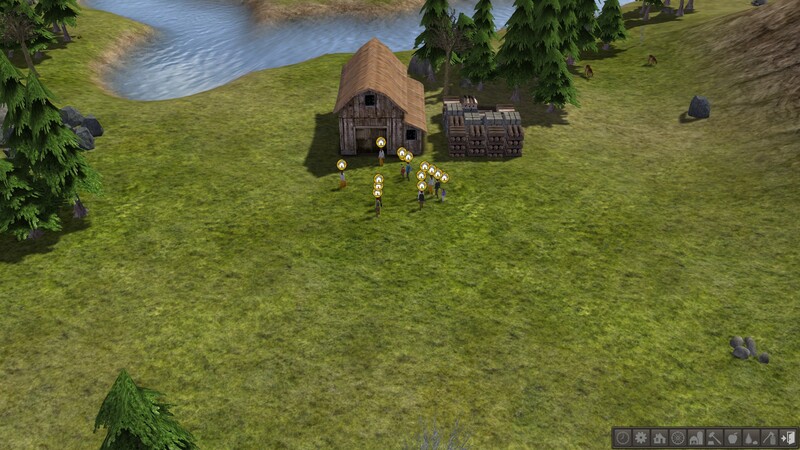 At its heart, Banished is a city building game with a twist. Just like my little story suggests, you start with a certain number of settlers and a limited amount of resources (how much of each depends on the difficulty level you choose; if it’s the easiest level, you get a few buildings, some animals, and so on. On the hardest level, you’ve got a cart with just a little food and firewood). You then have to build a city so these poor banished souls can survive. 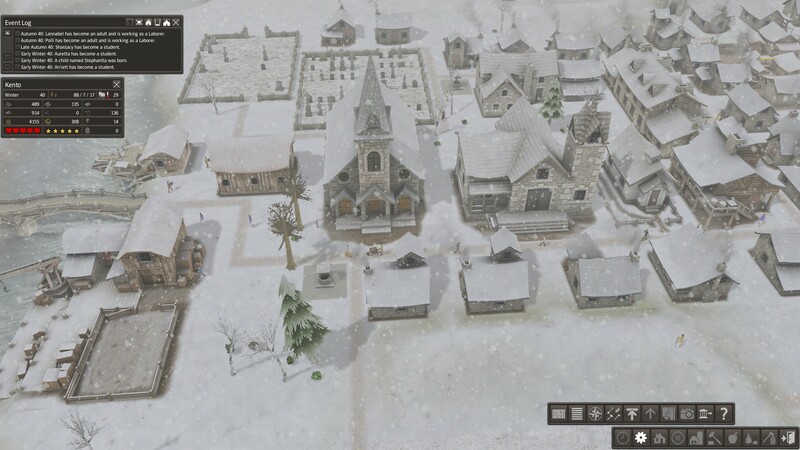 In most games like this, the player has to unlock buildings, either by researching the appropriate technology or by building the right prerequisite buildings. 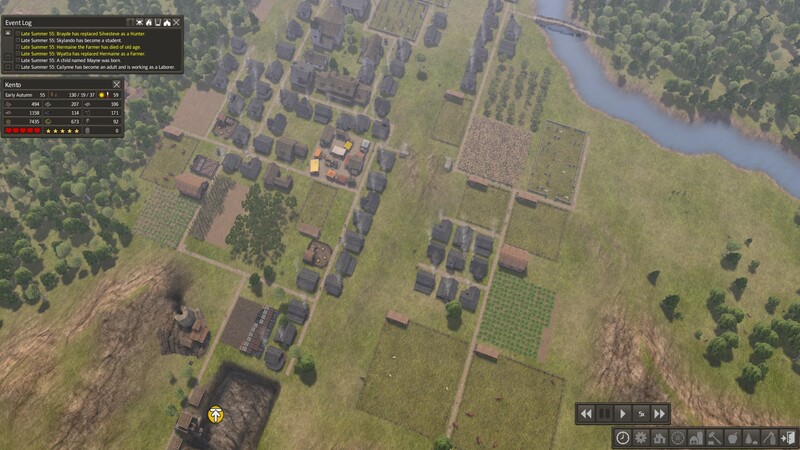 In Banished, however, the player can theoretically build all of the buildings from day one. There is no tech tree. There are no prerequisites. If you have the necessary materials, you can build it. Acquiring those resources can be difficult. It may not seem that way at first. The area around your new settlement is littered with trees, rocks, and iron. There are fish in the lakes and rivers. Deer roam the forests. There are roots, berries, and so on inside the forests as well. But here’s the rub: if you cut down the trees, it’ll be a while before they grow back. The rocks and iron, once harvested, are gone forever. To get the fish and deer, you need to build the right buildings. But your settlers also need shelter and clothing and tools and… Prioritizing your building is part of the problem. Do you focus on building houses first? Or food gathering facilities? Collecting the resources you need to build those buildings will take time. Will you have enough before the winter snows start? The early years of this game can be difficult. I had a lot of bad starts before I got the hang of it. For example, my first game, I didn’t realize I needed to construct a special building to chop firewood. As a result, most of my villagers froze to death (that may have been due to a glitch in the tutorials; one of them froze up on me). In another game, my villagers stopped having kids. Turns out, there’s a ceiling to how many kids your village can have based on the number of houses you’ve built. I didn’t know that, so when I didn’t build new houses, the villagers stopped having kids. By the time I realized something was wrong, the settlers were all dying from old age. The few who were left were too old to have kids. I did the math and realized that, within short order, I’d only have a brother and sister left. I didn’t want to see if, when they grew old enough, they’d…well… I stopped playing is what I’m saying. With Kento, I seem to have hit upon the right balance. Yes, I had that disastrous winter, but now, I’m producing twice as much food as I need year to year. I’m slowly expanding my housing. I’ve built every building there is in the game. And this brings me to my biggest gripe: so now what? Yes, disasters can occasionally strike. I’ve seen the flu in some games (hasn’t hit Kento yet, thankfully). There can be infestations in your animal pastures that can wipe out your animals, but I’ve learned how to deal with that. And apparently, you can have tornadoes too (haven’t seen those at all yet). But aside from that, the game now seems to be me just…adding. There’s nothing else to really do. I suppose I could start another village and see how well I do. But it just feels kind of lacking at this point. I’m not saying this isn’t a fun game. It is. It’s a lot of fun. If you like this sort of city building game, go check it out. Just don’t get too attached to your citizens. You never know what might happen to them. Your account of your experience is quite interesting from the perspective of videogame narratology. The narrative in these games comes from your experience, your interpretation of the results. I have been playing FTL again. I love the new additions, although there have been a few times the hacking ability seemed overpowered. But still, an awesome game just got awesome…-er.